THQ is asking for patience as it continues to struggle with the Ranger Pack DLC for Metro 2033, which prevents Achievements from being awarded after it's installed. Problems with the Ranger Pack first came to light the day it was released, August 3, when gamers complained of issues with Achievements after the expansion had been installed. 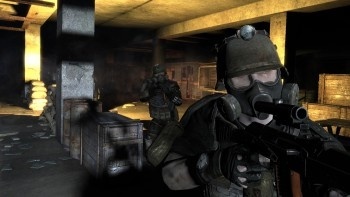 After a couple days of digging, THQ suggested the problem might lie with Microsoft rather than with Metro 2033 itself. More than three weeks later, however, a resolution remains elusive. "We understand some people are still experiencing issues with Achievements unlocking in the Metro 2033 Ranger Pack DLC," the company said in a new statement sent to Joystiq. "We are currently working with Microsoft to ascertain whether this is due to a code-related issue with the DLC itself, or an error in the Marketplace process whereby the DLC was added to Xbox LIVE Marketplace before the new Achievement data was added - this exact issue has happened to other games in the past, but we need to be sure that this is what's happening here." "We realize this is frustrating for those of you who have been waiting to enjoy the Ranger Pack DLC, and we ask for your patience as we try to pinpoint the exact issue and solution." THQ also tried to deflect some of the swirling unhappiness by dragging Microsoft under the bus with it in a recent Twitter post. "The update was fully tested by our QA, and passed Microsoft's own certification... So we were surprised to see there was an issue," it wrote. I have no idea how long fixing something like this would normally take, but three weeks and counting seems a bit excessive. On the other hand, as a fan of Slavic shooters I find it vaguely comforting to know that even one as refined and well-received as Metro 2033 still has the ability to bring sudden, inexplicable weirdness to the North American videogame market. So thanks for that, guys. Don't ever change.